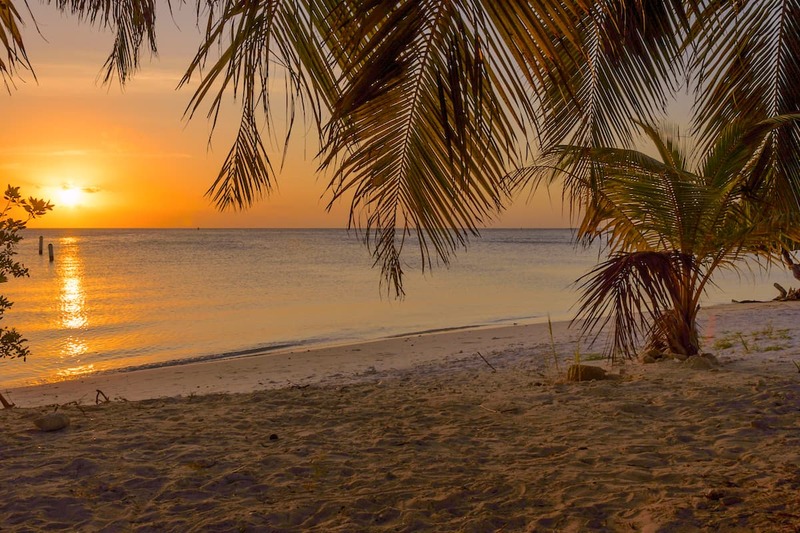 Sunset at Surfside Beach, Aruba, Dutch Caribbean. Welcome to Surfside Beach, Aruba, the crystalline Caribbean waters will sweep your worries away! Aruba has long been considered the land of perpetual summer. Thousands of tourists and vacation-goers arrive at the island to enjoy the sunlit lands. And Surfside Beach happens to be their favorite spot. This sunny strip of the Caribbean is covered in acres of soft toasted sand that promises to offer you your dream vacation. Surfside Beach is the perfect recipe for a lazy summer. You can lie around getting a natural tan all day long under the hot summer sun. Or fill the hours of boredom occupied with an exciting novel as you lounge on the beach. The ultimate prize here is witnessing the sunrises and breathtaking sunsets. So just sit back and watch the magical scenes of pristine summer day unfold before you. Are you a water baby? Then you’ll love diving into the water-centric activities available on the beach. Surfside Beach opens its doors to lots of adventure sports like scuba diving, canoeing, paddling, snorkeling and of course surfing. As an added bonus the Surfside Marina and Water Park are situated on the same shore. So you and the kids never run out of options on this side of Aruba. The cool hues of the Caribbean Sea beckon you to come over for a swim. While the backdrop of a rapidly growing urbane downtown ensures that you’ve got the best of both worlds right under your feet. Plus, the beach is just a stone’s throw away from the luscious green grounds of Aruba’s popular linear park. This stretch of land provides you with a platform to breath in the fresh air and enjoy the views. Surfside Beach is only a few miles away from the airport. So come here as soon as you drop that baggage at the hotel and enjoy the spectacular summer this side of Aruba offers. Surfside Beach is dotted with an array of colorful bars and beachside restaurants. Not only do they turn the heat up during the day. But they also spice up the party scene in the night. Hip, trendy and totally cool! That’s how people describe this hang out spot. It is open seven days a week for lunch, coffee and dinner. Surfside Beach serves up an exciting menu of spicy seafood, battered chicken wings and lots of refreshing drinks. Families come here to enjoy a lovely lunch with an ocean-front view. But the scene transforms as soon as the sky unveils the night. This ultra cool space is known foremost by its happy hours. That’s because the crew working at Surfside Bar knows how to throw a smashing party. With a tantalizingly delicious assembly of cocktails and wine― this bar will perk up your woeful Wednesdays and sober Saturdays in a matter of minutes. Happy Hours: Wednesday & Saturday from 5-7 PM. Barefoot is dubbed as a ‘tropical paradise.’ This fine dining restaurant has a lovely woodsy feel to it. It is famous for its luscious green palm trees and cabin-like dining area. The set up is arranged for a nice casual gathering with no strict dress code. Trust us, no one will bat an eye when you step into the premises in flip flops or barefooted. The owners just want you to have a gala time as you gorge down their seafood specials and signature dishes. But don’t let the rustic trappings deceive you for there is more to this restaurant than meets the eye. The menu features some extravagant and gorgeously decorated dishes that are on par with any other five-star establishment present in Aruba. We have the creative Chef Gerco & Maitre d’ Luc to thank for this invigorating merger. Keep calm and party on! Head over to Reflexions Beach Club to make some lasting summer memories! This little getaway is tucked under a cluster of towering palm trees. It is famous for its laid-back environment and vibrant arrangement of colorful umbrellas and lounge chairs. It also has a low pool for visitors who only want a quiet dip in the calm waters. These characteristics make it the ultimate beachside party place. The club opens its doors sharp at 8 AM every morning and closes down at 10 PM. This gives you lots of time to enjoy its scrumptious seafood platters, peppy cocktails, and tasty snacks. The ambiance here is peaceful and leisurely. This makes it an ideal spot for a romantic date with your beau. The crystalline cerulean blue of the Caribbean Sea invites you over as you enjoy a fine dining experience. Adding to the magic are the brimming glasses of champagne and soothing gusts of the summer breeze. Surfside Beach is easy to go to by bus or taxi or even by taking a walk. If you plan to go by car it only takes you a very short trip from the center of Oranjestad. When driving on L.G. Smith Blvd to the south just follow directions to Aruba Surfside Marina. It’s only a drive of about 1.5 kilometers.